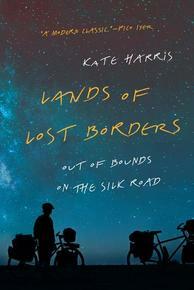 Kate Harris is a writer and adventurer with a knack for getting lost. 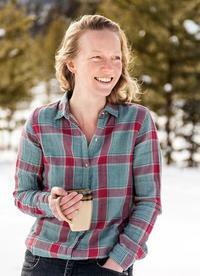 Named one of Canada's top modern-day explorers, her award-winning nature and travel writing has featured in The Walrus, Canadian Geographic Travel, Sidetracked and The Georgia Review, and cited in Best American Essays and Best American Travel Writing. She has degrees in science from MIT and the University of North Carolina at Chapel Hill, and in the history of science from Oxford, where she studied as a Rhodes scholar. When she isn't away on expeditions, or reporting on UN environmental negotiations for the International Institute for Sustainable Development, Harris lives off-grid in a log cabin on the border of the Yukon, British Columbia, and Alaska. Trevor Corkum: Lands of Lost Borders is a fantastic travel memoir, following your journey along the fabled Silk Road. When and how did you begin to work on the project? Kate Harris: In some ways, the answer is six years ago, in 2012, when I came home from the Silk Road and sat down at a desk, determined to write a book. In other ways the answer is my whole life. The questions the book wrestles with had obsessed me ever since I was both a bookish and adventurous kid, a kid who felt pretty confined and out-of-place in small-town Ontario and who aspired to be an explorer but figured she’d have to travel through time or become a scientist and go to Mars for that. TC: What is the legacy and value and meaning of science and exploration, especially now, on our mostly mapped, unevenly modern world? And how do borders of all kinds make and break what is wild in the world, from mountain ranges to people’s minds? KH: These questions really crystallized into focus on my first big bike trip abroad, in 2006, to China’s stretch of the Silk Road in Xinjiang and Tibet. I wanted to follow in the footsteps of Marco Polo—not to celebrate who he was (a merchant with the imperial backing of Kublai Khan), but to avenge my ideals of who I thought an explorer should be (a seeker of truth and beauty). When my best childhood pal Melissa Yule and I snuck illegally into Tibet on that trip, we confronted firsthand the sobering fact that borders exist for some people and not for others. And while there, in an occupied territory—the opposite of a mapless, nameless frontier—I perversely found all I’d been looking for in “exploration”: a feeling of being out of bounds, of every bend in the road yielding wild horizons, fresh mysteries. The idea that I didn’t have to go to Mars to experience this, but could find it right here on Earth, and on the world’s oldest superhighway to boot, came as a shock that was equal parts hopeful and uncomfortable. So after various misadventures in grad school, Mel and I returned to the Silk Road in 2011 to finish the stretch of it we’d left untravelled, namely the rather large gap between Europe and Asia, in hopes of further sounding out these conundrums about borders and wildness and exploration. And so the book was born. TC: Reading the book, many of your days were filled with gruelling feats of physical endurance—snow, rain, dangerous roads, long climbs. How difficult was it to write and document as you travelled? KH: Often the biking left me so spent by the time we pitched camp that jotting a few point-form notes in my journal was all I could muster. Other days I wrote nothing at all, but took photos or shot video footage, which would later help me summon the details of a certain place or encounter. I knew I wanted to write about the journey, so I tried to think of documentation as my only “job” on the cycling trip, the one thing I had to do other than just live the adventure. Often the biking left me so spent by the time we pitched camp that jotting a few point-form notes in my journal was all I could muster. Other days I wrote nothing at all, but took photos or shot video footage, which would later help me summon the details of a certain place or encounter. It’s funny, at the time, I lamented all the weeks we were forced to spend in cities, waiting on visas, and I resented having to take a train across Kazakhstan and part of China because of visas and time limitations. But these pauses from the trip’s otherwise propulsive intensity were incredibly fruitful, for they opened up the space for writing as opposed to note-taking. Boredom is a bonanza, a thing of beauty, for a writer, and there’s no boredom so profound as sitting in an Uzbek embassy in Baku, Azerbaijan, waiting for a visa that will never be granted. TC: One of the pivotal moments in the book comes when you decide to leave your doctoral research at MIT to head back to the Silk Road, part of which you had travelled earlier. What words of wisdom do you have for others who are contemplating taking this kind of leap? KH: From a young age, and for no reason I can point to other than reading too much existentially haunting poetry and prose, I’ve had an acute sense of my own mortality, of time passing in an accelerating rush and this being the one shot at life we know for certain we’ve got, because, as Annie Dillard observes, here we so incontrovertibly are. Why wait until mid-life to have a mid-life crisis? Of course, there’s a lot of privilege wrapped up in the idea of a mid-life crisis, which typically happens when people are in good health and have enough food to eat, enough money to pay the bills, and enough predictability in their lives that they step back and begin to question the meaning of their brief stint under the stars. But such questioning can also take place when you’re young, and the notion of financial stability or a steady job is just that, a notion, and one as remote to your reality as the Earth is to Mars, meaning you don’t have a whole lot to lose. Whatever the context, if you’re in a position to make the leap into doing something you’ve dreamed about doing, by all means do it. The fewer people going through the motions of life simply out of habit or because society applauds them for doing so, the better. Whatever the context, if you’re in a position to make the leap into doing something you’ve dreamed about doing, by all means do it. The fewer people going through the motions of life simply out of habit or because society applauds them for doing so, the better. TC: What’s a moment of learning or a story from the road that didn’t make it into the book? KH: Writing a book, especially a travel memoir, is an exercise in elimination: to parrot what Marco Polo famously said about his travels on the Silk Road, I did not tell the half of what I saw. The untold half, though, is pretty similar to what’s in the narrative: more stories about the kindness of strangers, and the wonders and horrors of life on Earth. The novelist and poet Anne Michaels observed that “there’s nothing a man won’t do to another, and nothing a man won’t do for another,” and every pedalstroke we took on the Silk Road—through lands with such a deep history of commerce and conflict and connection—offered further proof of this paradox. The novelist and poet Anne Michaels observed that “there’s nothing a man won’t do to another, and nothing a man won’t do for another,” and every pedalstroke we took on the Silk Road—through lands with such a deep history of commerce and conflict and connection—offered further proof of this paradox. TC: What’s the most important piece of learning you took away from the journey? KH: As someone who sincerely longed to emigrate to Mars as a kid, having dismissed this world as a place of diminished possibilities, biking the Silk Road revealed to me that the Earth is a wilder, weirder, more heartbreaking, and more hopeful place than I ever imagined growing up in fenced, paved southwestern Ontario. There’s no planet like it in the solar system, and it’s the only world we know of on which humans can actually breathe. Most astronauts who launch off this world reportedly find themselves not looking out (at the moon or Mars or the stars) so much as looking back, mesmerized by this pale blue dot we take for granted when it’s under our feet. Travel—whether into low-earth orbit, along the Silk Road, or vicariously in a book—lets you fall in love with the world again, allows you get to know it, as T.S. Eliot wrote, as if for the first time. It’s a way of coming home to where you already are.